Millions of people work to save energy in the United States. In our new multimedia project, People Who Save Energy, we introduce you to the people in this diverse and growing workforce. They work in every state, across industries and technologies. They make, sell, and install efficient products such as ENERGY STAR® appliances, build well-insulated homes, or offer energy-saving services such as weatherization. They are passionate about saving energy. At least 2.2 million people work some or all of their time on energy-efficient technologies and services, according to a 2017 report for the US Department of Energy. They outnumber the 1.9 million who work to produce electricity (solar, wind, nuclear), coal, oil, and gas. 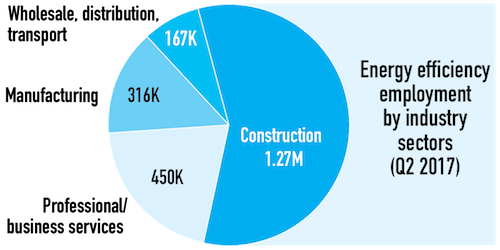 More than half of these jobs occur in construction. In fact, one of every five US construction jobs now deals with products proven to save energy. Other jobs are related to energy efficiency, too. The DOE reports another 0.7 million jobs that focus on vehicle fuel economy and alternative fuel vehicles and three million jobs that sell efficient (and other) appliances and building materials. These numbers don’t include the indirect jobs that result when customers spend or invest the money they save in lower energy bills somewhere else in the economy. At the same time, while efficiency employment grabs far fewer headlines than automotive jobs, a recent report by the Department of Energy found that efficiency employs about twice as many people. Yet people generally don’t think about energy efficiency in the same way they think about other sources of energy or other sectors of the economy. That’s understandable, because energy efficiency is not a commodity like oil, whose price we follow closely, and it’s not a bellwether industry like the auto sector, whose production and employment are key economic indicators. Energy efficiency itself is largely invisible, and its economic impacts are spread throughout the economy, making them hard to see. Investing in energy efficiency is vital. A key driver of long-term economic growth is productivity: how much we can create with the resources we have at our disposal. At its simplest, energy efficiency is productivity: getting more out the energy we use. Investments in energy efficiency feed the engine of long-term economic growth and the jobs that result from it. We see the power of this productivity when we do economic modeling of efficiency investments. We use the ACEEE DEEPER model to assess the economic implications of a range of efficiency policies and investments. In talking about the job-creating power of efficiency, most people imagine workers in hard hats installing efficient windows and other equipment. These are important and easy to identify, but our modeling consistently shows that for every job installing energy efficiency measures, the energy these measures save creates between one and three more. Investments in energy efficiency not only create jobs on their own but they also free up resources to invest and create jobs elsewhere in the economy. This is the power of energy efficiency. It helps us do more with less, creating a faster growing, more stable economy and the dynamic job growth that comes with it. When Elena Chrimat could not get a buildings job in the recession of 2008 in Arizona, she cofounded a small business, working out of her 1989 Land Cruiser to save energy in homes. Ideal Energy LLC now employs 10 people in Tempe. They did 1,179 jobs last year, including energy audits, installing efficient air conditioners and insulation, and sealing air leaks. With efficiency she “didn’t just want a job to make a buck [but] to do something more impactful.” See more stories like this in the fact sheet "Energy Efficiency—Jobs and Investment." More than 500 people work at the Johnson Controls plant in Toledo, Ohio, making advanced batteries that can be used with Start-Stop technology in cars and trucks such as the Ford F-150 and Chevy Malibu. Start-stop turns off the engine when you step on the brakes at a signal or in a traffic jam but keeps the air conditioning and electronics running. It reduces gasoline use in the car by about 5%. Tom Hughes, 31, worked in the auto industry for a decade, repairing cars and helping run dealerships. He didn’t find the work gratifying so a little more than two years ago, he switched careers. Following somewhat in the footsteps of his dad, a building inspector, he learned how to inspect homes for energy efficiency. He joined PEG, a Virginia-based engineering and consulting firm, as a HERS (Home Energy Rating System) rater. “I didn’t want to do a desk job,” he says. He enjoys doing blower door and duct testing in the field, and if a home doesn’t meet code or Energy Star standards, figuring out why. “It’s the best job I’ve ever had,” he says, adding people appreciate when you help them save money on their utility bills. Recently promoted, Hughes is now training others in the field. 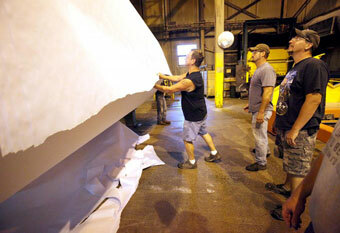 Rich Podrez (far left), a back tender at Flambeau River Papers, works to secure a large roll of paper before moving it to the shipping or converting facility. Image by Mike De Sisti. USA, 2012.